A Strauss waltz dances from the breakfast radio. Outside, the headless firs wave their arms like frenzied violinists in some arboreal orchestra. The tall birches, double basses of the tree world, waver and shiver, constrained by their stature – and protected by the violins. Seagulls by the dozen have soared in from the stormy sea, riding the wind in time with the waltz, more like skaters then dancers, wings outstretched like balancing arms, swishing around the celestial ice rink. Our topsy-turvy house is chaos indoors, while outside nature screens an ever-changing picture show. We’re breakfasting upstairs, in the dining room of our 1970s ‘tree house’, built of bricks, not branches. It’s not really a tree house, its feet are planted firmly in the ground, but it feels like it today as the wooded edges of the golf course dance around us in the gale. No golfers have yet braved the 13th or 14th green, but then it’s Monday and the wind’s becoming higher by the quarter hour. Perhaps, for once, they’ve been blown off course. The teapot’s almost empty, three cups, each, already drunk. 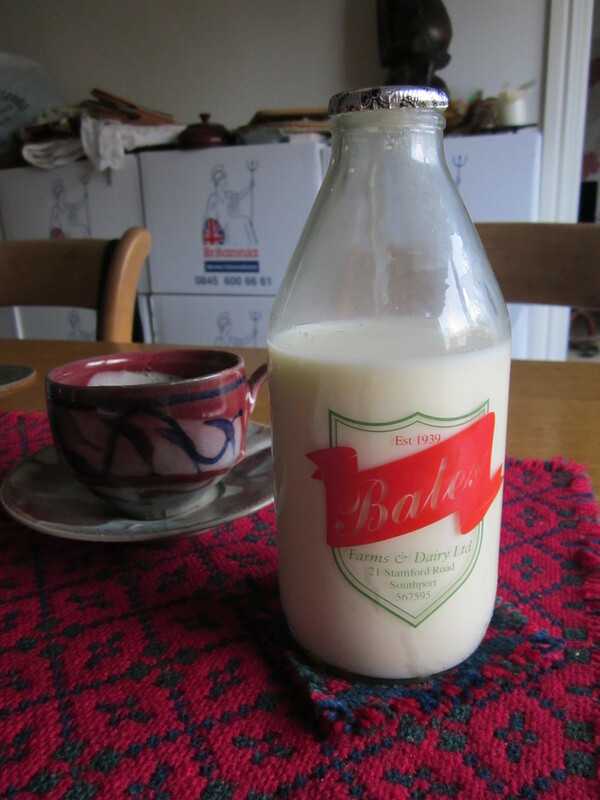 The milk, a pint bottle, delivered to the door, has a red label boasting its Lancastrian origins and the independent dairy’s 70-plus year pedigree. Crumbs linger from a piece of toast and damson jam, good bread from the family baker a mile and a half down the road. They’ll have been open since seven after baking through the early hours. It’s been a pleasantly late and lazy morning for me so far – but once the hands of my new watch (a birthday treat) tell me it’s gone nine, I’ll call the local carpet man. He’s kind of flat faced, the carpet man, expressionless, but stoic underneath, as if he’s had bad news but knows he must carry on. And then he talks about making carpets. It’s as if he has been possessed by a happy spirit. His eyes widen, his mouth twitches into a smile, his hand puckers up as he picks an imaginary tuft to show a one-time customer. Yes, seven years ago he was making carpets. Not in some vast factory that’s since succumbed to the brutal trading of commercial affections, but a small workshop behind a shop, just a couple of miles down the road in the other direction from the bakery. A normal shop at the front, behind was a workshop where they made carpet to order. It’s hard to imagine, isn’t it? And only seven years ago. The spirit leaves him and he’s a deflated individual, just selling again. He gives us a good price and it’s made in Rochdale, not too far away, still Lancashire. Mostly wool. So there are some mills still left in this deep rooted, ancient county, even if their chimneys no longer belch out the foul smoke that made the red brick black in the bad old days. And for those of you who’ve been asking after the religious for a year experiment… well, we’ve been to our new local Church three times in eight days – the last Sunday of Advent, Christmas day and last Sunday, the feast of the Holy Family. It was a worry, how would it compare with the splendours of Saints Peter & Paul, the choir, the beautiful surroundings. Well, more of Our Lady of Lourdes – and Father Atli – and the twelve altar servers – anon. It’s time to face the day. To unpack more boxes, measure for blinds and curtains, order a cooker to replace the one whose dial has no figures and whose 14 years have worn it out. Cooking with an oven thermometer has been interesting but not wholly successful over Christmas. Yes, one more Christmas, one more birthday under my expanding waistband, one new Year on its way. And we, snug in our new house, have, since the moment the last removal man left – with a great big hug – a lovely, warm, comforting, new home. And from here may I wish you all a peaceful and joyous Christmas (it doesn’t end till 6 January you know) and a happy, healthy and prosperous new year. This entry was posted in Lancashire & the golf coast, Religious for a year: Atheist-man's experiment and tagged Bates Dairy Southport, Birkdale, carpets, Dancing, golf, Lancashire, milk, moving house, seagulls, Southport, trees, waltz. Bookmark the permalink. Glad to hear that you are settling in and keeping snug. All the best for the new year! I didn’t realise you were moving so soon. So glad to hear you’re there. Sounds like a good place to be, beside a golf course and perhaps not far from the sea. Have you sold the other house yet? So you’re beginning another year in more senses than one – may it be good to you. We went to a pre-Christmas choir evening in the local church, equivalent more or less of a carol service, except hey added Auld Lang Syne, but they also sang “Adeste fideles” and “In the bleak midwinter”, very nostalgic for me. Hello John and happy 2014 to you. Not sure about Auld Lang Syne (never really liked it) but love Adeste fideles especially in the Latin. We went to 3 very different services over Christmas in our new location and sung lots of old faithfuls. Yes, neither of us golfs but it’s a protected area for wildlife too and the trees around us are wonderful. The sea is not far way, indeed – and has been very lively recently! It has taken seven months to move, that included one sale falling through 2 weeks before it was due for completion and a quick 6 week sale to a new family – we moved out of the old and into the new on Friday 13 December. You mean you still have milk deliivered? I thought that had long since gone by the board. How very nice. And good to hear the new house is warm and comfortable. We’ve always tried to keep having a milkman – this one is great, arrives early 6 days a week with our pint bottle – our last was three days a week – the dairy itself is just a couple of miles away, despite this being quite a suburban area in many ways it borders lush farmland. I forgot to mention we saw a week-long series of Great Canals of the World, among which the Leeds-Liverpool canal: Leeds-Bingley-Skipton-Burnley-Wigan-Liverpool, which ended at a former warehouse now listed historic building in a Liverpool dock, where musicians of all sorts can come and make recordings. The programme finished with an aerial view of modern extensions to the canal. Haven’t seen that, bet it was interesting – yes, the re-opening of the last leg of the canal into Liverpool was quite something. The docks are looking great.